For the past two years I have lightly dabbled in the world of art and craft fairs. It was easy to get involved in the beginning, my school offered an annual Artist Market, and all of the set up was provided. After experiencing success, I decided to keep an eye out for other, indoor festivals. I wasn’t quite ready for the investment of the display and tent for an outdoor festival, but felt ready to step outside of the comfort zone of my school and explore other possibilities. Nick helped build a beautiful display for my first festival in Athens. I had moderate success, and continued to pursue other opportunities. 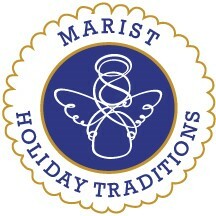 Since the beginning of my festival quest, I have heard about the Marist Holiday Traditions. I have heard rumors about the crowds, the eager buyers of all things handmade, and the huge size of it. Last year, while participating in Wesleyan’s Artist Market, another vendor raved over my items and urged me to apply to Holiday Traditions. It was just the confidence boost I needed, and I submitted my application. In addition to the Marist art show, I also submitted applications to St. Pius X Marketplace, and the Marietta Whimsical Wares. I was thrilled when I found out I was accepted to all three, then overwhelmed when I realized they were three weekends in a row. I quickly set aside my fears, and got to work. I have spent the last couple of months pumping out work, and can’t wait to put it on display. I will have some pieces from last year as well as a number of new additions. I plan to post pictures of my latest work throughout this week. I will have matted, letter prints for just $10.00 each. This is a personalize and cost friendly gift option. 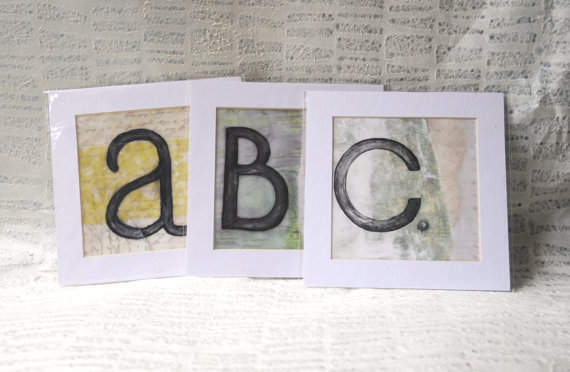 These prints are made from my mixed media encaustic letter paintings, which will be available for $25.00 each. Combine letters to spell a word, to represent each member of a family, or create a monogram. 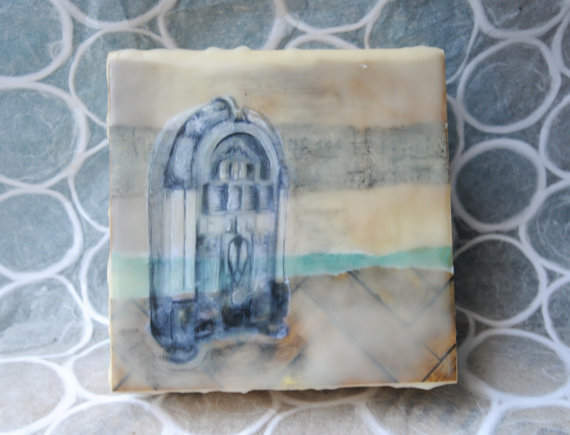 I will also have my 6″x6″ encaustic paintings. I have added 17 new pieces. 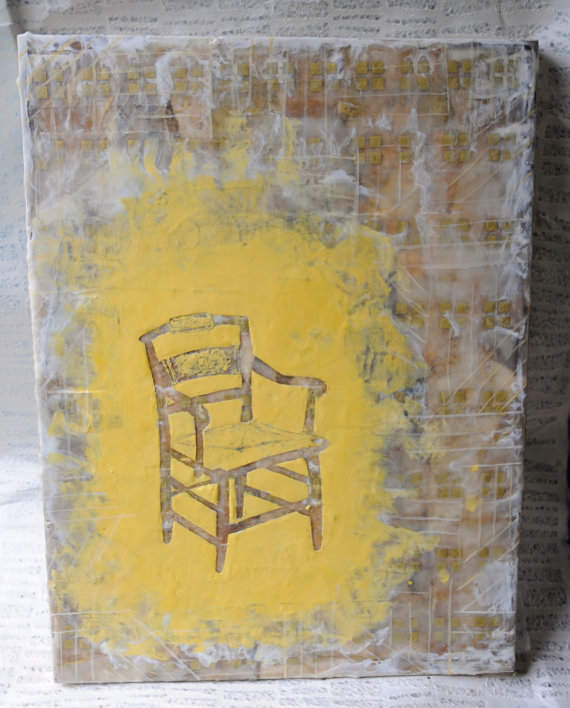 Each one is layered with collage paper, an image transfer, and oil paint. I love seeing the connection people have with each painting. A jukebox may spark a childhood memory in one person, while another remembers being rocked to sleep looking at the rocking chair silhouette. Each painting is meant to spark feelings of nostalgia, little snapshots of objects tied to our memory. These will be available for just $35.00 each, a very affordable price for a one of a kind gift. I have also continue to experiment with larger “object” encaustics. I select an object I feel connected to, and turn it into an encuastic collage. 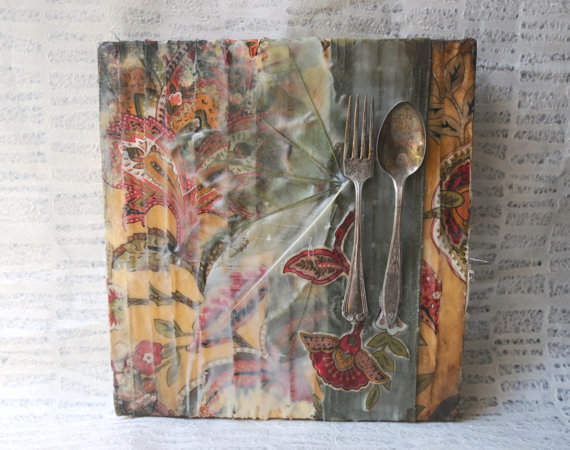 I layer paper, encaustic wax, and oil paint. Once I have my layers set, I lightly sketch the object into the wax, then carve it out, revealing the layers in the background. I love the simplicity of the shapes, with the complexity of the background filling the negative space. Similar to my 6″x6″ paintings, these also focus on the how we tie memories to objects. This mixed media piece will be available at the raffle! I hope it finds its way to a good home. Marist claims to be one of the largest juried art and crafts shows in the Southeast, and based on the information I have received so far, I believe it. If you live in the Atlanta or Georgia area, come check out the Marist Holiday Traditions. It is the perfect season for shopping, and the perfect place to buy a unique, handmade item for gifts. Address is below, I hope to see you there! Remember, perfection is overrated, buy handmade. 3790 Ashford-Dunwoody Road, Atlanta, GA 30319. Thanks for taking the time to check out my blog. Help me spread the word about my blog and this amazing craft fair by sharing on your social networking site of choice. Thanks for stopping by!